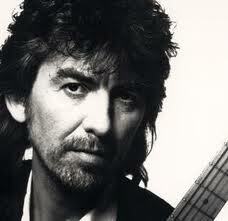 I wrote this article three days after George Harrison died of cancer back in 2001. (Has it really been that long?) It was published elsewhere, but I retain the rights and I was going to republish it back in November in honor of the 10th anniversary of his death, but I couldn’t find it. I ran across it this evening, and belated though it is — here it is. I was a Freshman in college the first time I really took notice of the Beatles. A lot of things were happening in my life, and I was going through a stretch of musical snobbery that drew me more toward classical, jazz and other “real” music. December of ’62 was the Cuban missile crisis, and I was so caught up in the thrills and confusion of a college campus a thousand miles from home — and so self-centered — I barely noticed that! And the long hair: you have to remember that I grew up in a small Southern town. Long hair? Well, that got my attention. Although it was a few years later when I realized that it was actually OK for me to enjoy popular music — at which time I became possibly the most belated Beatles fan of my generation — John, Paul, George and Ringo were part of the National Consciousness, and thus a part of practically everyone’s lives. A few years later, after the group broke up (! ), we lost John, and along with him whatever vestiges of innocence that the murders of JFK, RFK and Dr. King might have left untouched. It was definitely time to grow up. Broken up or not, the Fab Four remained part of our lives. We saw Sean begin to show at least some of his father’s incredible talent. We watched the evolution of Paul from immensely-gifted teenager to knighted composer of symphonies, and we mourned with him the loss of his Linda. We saw Ringo maintain much of the flamboyance that had made him the Clown Prince, while becoming mentor to young musicians and one of the Grand Old Men of rock. Where was George? Having broken out on his own in a big way after the group dissolved, he sort of stepped back out of the limelight after John was killed, and became a bit of a recluse. He continued to perform wonderfully — both solo and with the likes of Clapton and the other Traveling Wilburys. He still showed us from time to time his masterful ability to craft those intricate guitar runs and slightly asynchronous melodies, but he never again really projected himself into the forefront of our consciousness, preferring quiet composition and running his production company. After “All Things Must Pass,” Harrison remained not a has-been so much as the Beatle who ceased beating his own drum. He was still the artist who could put together masterpieces like “Something” and “Here Comes the Sun,” but seemed to have lost the need to promote himself. Even back when when he went off to India for the first of his spiritual pilgrimages, it was The Beatles who sat at the feet of the Maharishi, not George Harrison. When George continued his studies for thirty years and became a scholar of eastern philosophy and an expert on Indian music, we noticed the addition of that influence in his work — it did, after all, cause major changes in rock — but few realized that George was for more than twenty years the spiritual disciple of Ravi Shankar, the great sitarist, as well as his apprentice. There was so much we didn’t know about him, because he preferred it that way. But us Boomers are intensely aware of George now — you’d better believe it! We lost a good many of our icons when we were younger — Lenny, Elvis, Janis, Van, John, and the others — but George Harrison was the first giant of our generation to die, not from drugs or a madman’s whim (though he nearly did), but from the natural causes that we all secretly fear. This entry was posted in Culture, Entertainment, Music, Nostalgia, Seniors and tagged beatles, Culture, Entertainment, George Harrison, Music, Nostalgia, Ravi Shankar, Seniors, The Quiet Beatle on April 13, 2012 by Bill. Thank you, sir. I wish I had time to do more of my own, and not so much for other people, but that’s life — and making a living.